Since the shutdown started at the end of December, immigration court hearings that could be the difference between someone getting permission to stay in the United States, or get deported, have had to be rescheduled. "People who have been waiting for years are now hitting these setbacks that will push them back a few more years until they have a final hearing," said immigration attorney Jessica Rodridguez Bell. A statement on the Department of Justice website says "Detained docket cases will proceed as scheduled. Non-detained docket cases will be reset for a later date after funding resumes." Full statement from the U.S. Department of Justice. Rodriguez Bell says that means someone who is currently waiting for their hearing date behind bars are still getting hearings with judges, because those judges and their staff are considered essential employees. But hearings for people who have been released are being rescheduled for the next available opening on the judge's calendar. Eliseo Rodriguez De La Cruez was arrested during a raid on Corso's Flower and Gardening Center over the summer. He faces deportation when he's due back in court in February. Immigration attorney Brian DiFranco says those hearings usually require a three-hour block, which is hard to find because the Cleveland Immigration Court is already so backlogged. 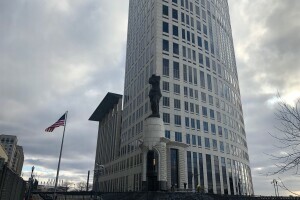 "On most of the Cleveland judges' calendars, that results in either 2021 or 2022 for that next available three-hour block of time," said DiFranco. 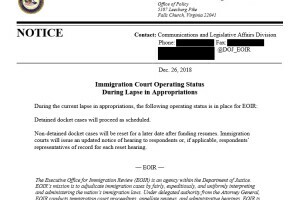 Cases scheduled for hearings on each day of the government shutdown might have been pending for months or years already only to suddenly be pushed to the back of the line. Eliseo Rodriguez De La Cruez (right) stands with his son, Jimmy, during Jimmy's high school graduation. 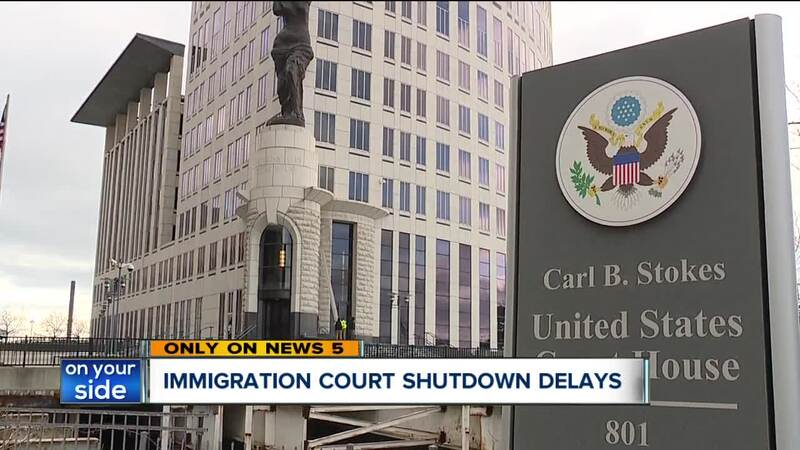 Eliseo is waiting for a court date in February at the Cleveland Immigration Court that lawyers say likely won't be affected unless the government shutdown lasts until then. It extends the uncertainty, but can also benefit Rodriguez Bell's and DiFranco's clients in some ways. "Some people are happy because that gives two or three more years to see if there is any kind of immigration reform that might help them," said Rodriguez Bell. She says a new administration could bring more lenient policies or immigrants might marry a U.S. citizen or have U.S. citizen children, which could change the chances they'd be allowed to stay in the United States. "Others who are ready to move forward with their case and are tired of being in limbo, whose cases have already been dragging on for years aren't as happy," said DiFranco. The Carl B. Stokes Federal Courthouse Building waits for many federal workers to return after the government shutdown. He says one client needs a much shorter hearing for the final step of her asylum claim. DiFranco says that might be delayed for as long as a year to essentially rubber-stamp her final approval. Since the shutdown can end any day, the lawyers and their clients only find out the day before hearings that they are being rescheduled two to three years into the future. He says as soon as the government opens up, the scheduled hearings for that next day should proceed as scheduled.